The Heinkel 111 was designed by Siegfried and Walter Günter in the early 1930s and produced for the emerging Luftwaffe in violation of the Treaty of Versailles. Often described as a "Wolf in sheep's clothing", it masqueraded as a transport aircraft, but its purpose was to provide the Luftwaffe with a fast medium bomber. Perhaps the best-recognised German bomber due to the distinctive "greenhouse" nose of later versions, the He 111 was the most numerous and the primary Luftwaffe bomber during the early stages of World War II. It fared well until the Battle of Britain, when its weak defensive armament, relatively low speed, and poor manoeuvrability left it exposed. Nevertheless it proved capable of sustaining heavy damage and remaining airborne. As the war progressed the He 111 was used in a variety of roles on every front in the European Theatre. It was used as a strategic bomber during the Battle of Britain, a torpedo bomber during the Battle of the Atlantic, and a medium bomber and a transport aircraft on the Western, Eastern, Mediterranean, Middle Eastern, and North African Fronts. Although constantly upgraded, the He 111 was obsolescent during the latter part of the war. It was to have been replaced by the Bomber B project, but delays and the eventual cancellation of the project forced the Luftwaffe to continue using it until the end of the war. Manufacture ceased in 1944, at which point, piston-engine bomber production was largely halted in favour of fighter aircraft. With the German bomber force defunct, the He 111 was used in transport and logistics roles. The first He 111 flew on 24 February 1935, piloted by chief test pilot Gerhard Nitschke, who was ordered not to land at the company's factory airfield at Rostock-Marienehe, as this was considered too short, but at Rechlin. He ignored these orders and landed back at Marienehe. He said that the He 111 performed slow manoeuvres well and that there was no danger of overshooting the runway. Nitschke also praised its high speed "for the period" and "very good-natured flight and landing characteristics", stable during cruising, gradual descent and single-engined flight and having no nose-drop when the undercarriage was operated. However during the second test flight Nitschke revealed there was insufficient longitudinal stability during climb and flight at full power and the aileron controls required an unsatisfactory amount of force. By the end of 1935, prototypes V2 V4 had been produced under civilian registrations D-ALIX, D-ALES and D-AHAO. D-ALES became the first prototype of the He 111A-1. On 10 January 1936, and received recognition as the "fastest aircraft in the world", as its speed exceeded 402 km/h (250 mph). However, this was incorrect; the fastest aircraft at that time was the Macchi M.C.72, which broke the record in 1934. The main variant, and the one to see most action during the Battle of Britain, was the "H" model. 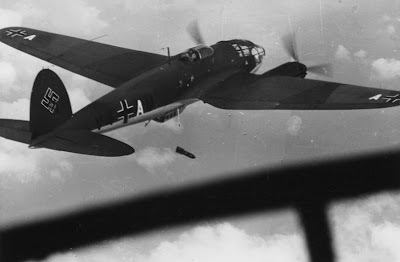 The He 111H-1 was fitted with a standard set of three 7.92 mm (.312 in) MG 15s and eight SC 250 250 kg (550 lb) or 32 SC 50 50 kg (110 lb) bombs. The same armament was used in the H-2 which started production in August 1939. This was replaced by the H-2, powered by improved Jumo 211 A-3 engines of 820 kW (1,100 hp). By 2 September 1939, the Luftwaffe had a total of 787 He 111s in service, with 705 combat ready, including 400 H-1 and H-2s. There was then produced the upgraded H-3 version with the 895 kW (1,200 hp) Jumo 211 D-1, which came off the lines from October 1939. Experience during the Polish Campaign lead to an increase in defensive armament. MG 17s were fitted whenever possible and the number of machine guns was increased to seven. Normally one MG 17 would be installed in the nose, one in the ventral position, dorsal position and one in each waist window position. The two waist positions received an additional MG 15 or 17. On some Heinkels a permanent belt-fed MG 17 was installed in the tail. To meet demand for numbers, Heinkel constructed a factory at Oranienburg. On 4 May 1936, construction began, and exactly one year later the first He 111 rolled off the production line. The RLM Luftwaffe administration office suggested that Ernst Heinkel lend his name to the factory. The "Ernst Heinkel GmbH" was established with a share capital of 5,000,000 Reichsmarks (RM). Heinkel was given a 150,000 RM share. The factory itself was built and belonged to the German state. From this production plant, 452 He 111s and 69 Junkers Ju 88s were built in the first year of the war. German production for the Luftwaffe amounted to 808 He 111s by September 1939. A further 452 were built in 1939, giving a total of 1,260. The type suffered 756 losses during the Battle of Britain, out of a total 5,656 built between 1939-1944.